Life is short... do something! Somehow– without so much as raising one literary eyebrow in the past–I find myself in the just plain weird situation of being chosen as a “roving correspondent” for an outdoor magazine. I'm a rover, of that you can be sure. I played rover on softball teams for more years than I care to remember. Coach knew I wasn't well suited for staying in one place too long. I don’t play an allotted position very well. I like to move around, if you know what I mean. Nomadic. 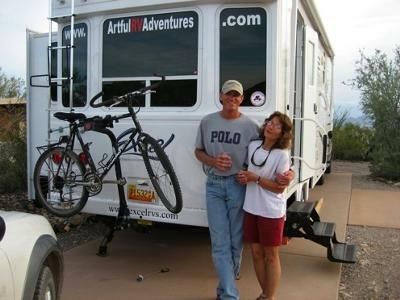 My wife, Bobbie and I are on our third RV sabbatical in ten years. I was only forty-nine when we quit our jobs and sold our house in order to help finance our first journey. It was scary but worth it. Would we do it again? A better question, will we ever stop? Hear me. Have you really, I mean really, seen what is in your backyard? Do you know the unspoiled white sand beaches of Baja? The Canadian Rockies with their fearsome Grizzlies and Moose big as a truck clopping down Main Street Jasper? Do you know the Ozark southern comfort of Eureka Springs, Arkansas...and that she has a twin in Arizona named Jerome? Have you felt the spray from Big Sur’s angry surf? Worshiped in Sequoia’s temple of majestic trees? Raced through an Alaskan forest strapped to a dogsled? Have you discovered that good vacations are always over long before you’re ready to go home? Have you wished you could step off the treadmill for an extended amount of time before your T ...I ...M ...E is up? Do you need a sabbatical? Are two short weeks really enough time to renew your spirit and brace you for the fifty weeks that stand between you and your next opportunity at renewal? What if you would experience a journey instead of a vacation? I’m talking about traveling –or better yet, wandering ...un-tethered, for months, even a year. I must be dreaming. It is winter and I am outdoors ...comfortable, warm even, in shorts and tee shirt. My Colorado home seems a million miles away. I sit alone by a small creek as it murmurs beside me. ...My eyes regain focus as I survey this foreign environment. There is no ice on the creek. I am bone-warm, reclining against a speckled granite boulder targeted by the sun. “I would like to thank my mother, my father and Charles Kuralt,” I say to my disinterested foraging friends, “for both the gift and curse of their gypsy ways during my impressionable youth.” Is there any wonder I’m partial to Rand McNally as an author? Songbirds chirp from thorny-limbed, ebony mesquites. Beyond them, pastel white sycamores, wrapped in skin smooth as a lover’s cheek, tower into a cloudless cobalt sky. I drop a rock on my toe to verify this new reality. Not a dream. We have “boondocked” for weeks at no cost in our RV on the edges of flaming red rock canyons and among purple mountain majesties all across the west. Boon docking is free because you are camped on government lands in the boonies instead of traditional RV parks or campgrounds. The west teems with millions of scenic acres of national forest, BLM (Bureau of Land Management) or state lands where you can pick your own secluded location at which to camp. When it got a little too warm to hike and bike in Utah’s desert canyon lands, we moved on to cooler elevations. Amid fragrant pines and cool breezes atop a high pass on Boulder Mountain, we made camp near a creek and were lulled to sleep each night by the music of flowing water. We have winter camped on ocean front beaches. At Padre Island National Seashore in south Texas, the sand is firm enough to drive and bike on. It was there that the surf lapped right up to our doorstep during each day’s high tide. It’s a wonderful place to camp during winter because of prevailing Gulf breezes from the Caribbean and southern latitude not unlike south Florida’s. The dream is not for everyone, and trust me, it’s not always easy. But I have met others who measure their wealth in terms of freedom, instead of assets. One common thread that weaves through most stories by the nomadic souls traveling this path is the story of those who didn’t live to realize their travel dreams. Like them, I have a story. Under a wooded canopy, I followed the serpentine creek back to our camp at the mouth of Madera Canyon. Soon, I was sipping a fine Merlot and savoring the aroma of steaks sizzling over glowing embers of mesquite. After dinner and a few pages in Steinbeck’s East of Eden, sleep began to nibble at my consciousness; I couldn’t help but smile. As she turned out the light, Bobbie asked, “What’s with the silly grin?” “Just thinking,” I replied. “Just thinking.” This... is going to be fun. You took the feelings right out of my heart! You have a fantastic story! Thank you so much for sharing it.